When it comes to security software, Norton is one of the most popular and powerful name. Recently, the company made a debut in hardware products as well. Norton Core is the first home router to be manufactured by Norton. 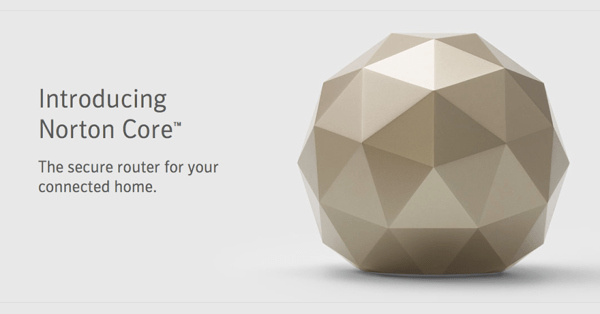 The Norton Core router can be described as a powerful dome-shaped device which only measures 15 x 15 x 13cm (6 x 6 x 5 inches). However, it is packed with powerful hardware inclusive of a 4GB flash memory, 1GB system memory and a dual-core 1.7 GHz processor. The router has two bands and supports the latest 4 x 4 ACw2600 Wi-Fi standard. As a result, it has up to 800Mbps on the 2.4 GHz band and 1.73 Mbps on the 5GHz band. Symantec says the router’s Wi-Fi has the ability of covering a home between 3,000 and 5,000 square feet, making it great for larger homes. It also has four Gigabit LAN ports to be used by wired clients. Since the gadget is Network ready means it can be used as part of a home wireless frequency network in the future. Users will be showed how this can be implemented later in 2017. There is nothing new about security protection at router level. For example, companies such as Asus have teamed up with Trend Micro in a bid to offer free security protection on their high-end routers like the RT-AC88u and RT-AC5300. The Norton Core has gone a step further by ensuring their protection is comprehensive to home users and not only high end clients. For instance, you can monitor using a mobile app and see a list of online threats that router has been able to block successfully. It additionally shows the user the level of safety of their home network with a credit-score rating using numbers. In this case, the number 500 shows a completely safe home network while zero means the network is completely vulnerable. Lastly, the mobile application can be used to pause or disconnect any device or set a bed-time to ensure the device will not be able to access internet. 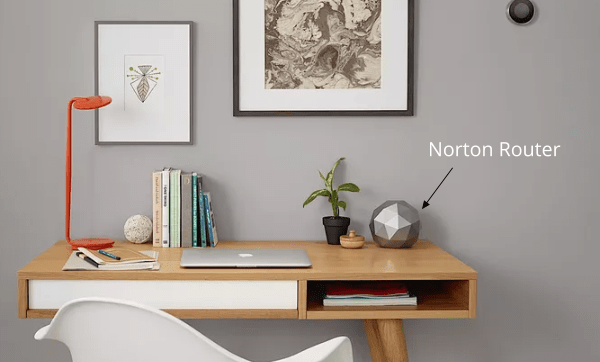 The Norton Core – secure router for connected home is app enabled and has built-in security to ensure the entire home is protected, instead of protecting just one individual device or computer. Symantec says the whole point is to keep all connected devices safe. This includes tablets, phones, Macs, Windows computers and any internet-of things devices. According to Symantec, a team of security experts who are constantly eliminating and analyzing cyber security threats worldwide are used to back-up the system. To keep any device connected to it safe, the router receives regular updates on cyber crime protection mechanisms and information. If an infected device connects to the network, the router will isolate it from other devices which prevent the spreading of the malware. The Norton Core is currently available in the United States with a price approx $200. It is available in two colors, you can choose between granite gray and titanium gold. The price is inclusive of a one year subscription to Norton Core Plus, which is the company’s security protection. After the year is over, the user can renew subscription at $99 for every year. The subscription comes with 20 Norton Security software licenses. They can be installed on computers to ensure they are safe even when the computers are used outside Norton Core’s network. Users can opt to not renew subscription. This does not mean the router will not work. It only means the router will be like a regular router with standard security features. If you want to have a secure home connection, then the Norton Core router and its security subscription are highly recommended. Parental Control features with Time management, Content filtering, Pause Internet. If you are looking for a great router for your home network, you will need to be careful what you buy. The current technology has made an increase of cyber-attacks possible even in the home. The best way to be secure would be using a router designed to protect your home network with similar strategies used to protect an office or company network. The Norton Core is such a router and you should seriously consider it as one of the best options. Please post your comment and experience in the comments section. You have grossly understated the router’s speed on the 5GHz band. You indicated 1.73Mbps. It should be 1,733 Mbps. That a thousand times faster than you indicated.